The 1970s was a decade of fashion extremes…. Floaty fashions of the post-hippy culture mixed with stomping platforms and glam rock but by 1978 when the House of Mirelle closed every inspiration was up for grabs. Fashion design was diverse, streetwise and truly international. By mid 1978 tailoring, disco and the romantic look had merged and Hull’s high street reflected the trends. 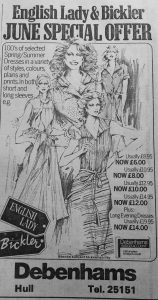 From Binns to Debenhams to Stuarts Outsize Fashions their stock was a snapshot of what was great about 1978. 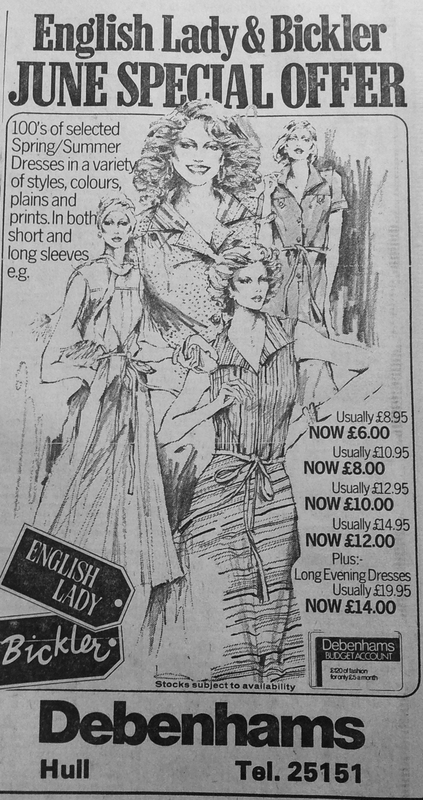 And this advert for Spring / Summer 1978 shows the trends…. In 1971 Yves Saint Laurent launched a tailored look for women – think Bianca Jagger in a white trouser suit – and it affected the big collars and softly tailored lines seen in their advert in June. 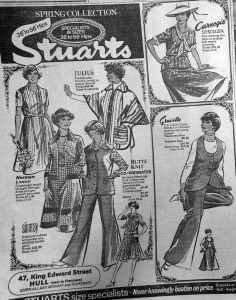 Stuarts, the outsize fashion shop on King Edward Street. At the same time the romantic look we now call Boho was floating through people’s wardrobes. But perhaps what influenced Debenham’s displays most was the practical clothing of American Diane Von Furstenberg. She said modern fashion had to be practical as well as stylish. The revolution hit our shores as much as it did across the pond. At 47 King Edward Street it specialised in dressing the larger lady. In 1978 ‘larger’ meant over a 42 inch hip a size we’d think normal today. 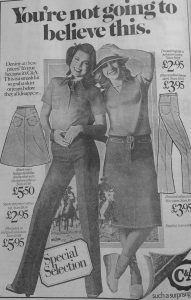 We can see in the advert they stocked everything from trouser suits to ponchos, knee length skirts to hats. 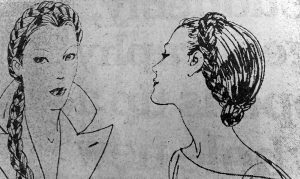 Wrapping plaits: The inspiration for Princess Leia..
Their Spring collection was as stylish as any other on Hull’s high street. It wasn’t all about clothing though – hair got a look in. In the year that launched Sci-Fi’s most successful franchise wrapping plaits around your head was already de rigueur before Princess Leia arrived on the big screen. Straps and T Bars, super elegant on your feet. 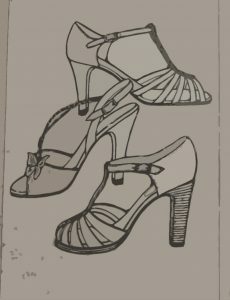 Ladies of Hull were tapping the streets in high heeled strappy sandals. T Bars ran up the front and polished toenails peeked out. They were perfect for dancing to Chic’s Le Freak! Coats were designed with hoods attached. They were non-detachable and set in to the main body of the coat. Using large amounts of fabric they hung wide and loose from the shoulders right down to mid calf length. Blanket Coats were warm and stylish, perfect for the long winter months. Blanket coat: with hood attached. But perhaps the trends that stick with us were in C&A. Jeans, skirts and T Shirts – these are the fashions we wear today! 1978 was the year when everything changed. It was the last year of the House of Mirelle. With its closure Punk and New Wave were already making changes and the era of Princess Diana and the New Romantics were on their way. C&A 1978 the fashions we wear today!